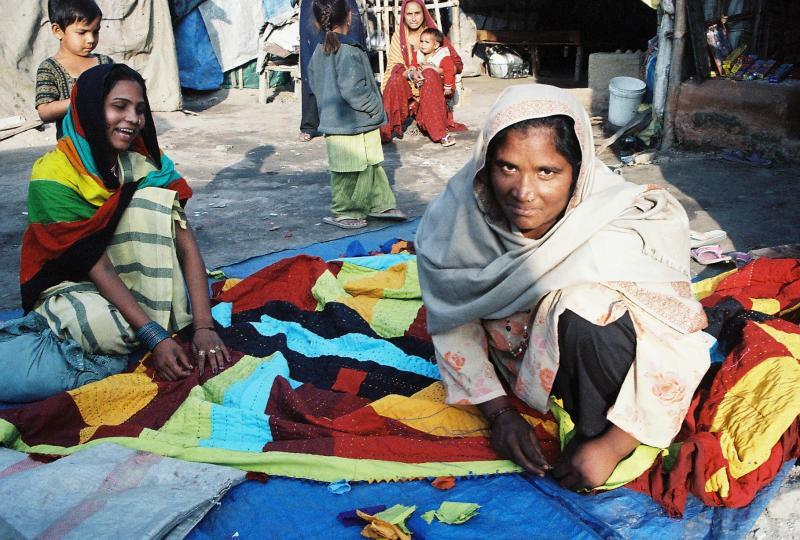 The women of Quilts for Kids Nepal come from the states of Punjab and Rajasthan in India, near the border with Pakistan. In Kathmandu, they continue to live in a traditional Hindu community, with two or three generations of family members being supported through group effort. Having received almost no formal education, these women are usually married by the age of 18, immediately start a family, and begin taking care of in-laws. Quilts for Kids Nepal helps turn women's traditional skills into sustainable income for themselves and their families. This not only empowers the women in the community and gives them a sense of pride, but it also helps them play an active role in the education of their own children. It takes three or four women approximately ten days to make one quilt. Quilt making is a time for the women to share stories, discuss family problems, and of course, catch up on a little bit of gossip! More importantly it is often a time for passing on skills and wisdom to a younger generation. Through Quilts for Kids Nepal, many young women are learning traditional quilt-making skills and finding out, for the first time, the real value of their own creativity. To support the women of Quilts for Kids Nepal, make a donation today. That money will be used to purchase cloth and thread, and to help pay the women's salaries.